Care to be Different > Articles > NHS Continuing Healthcare > Care notes and NHS Continuing Healthcare: inadequate evidence? What happens after a positive Continuing Healthcare funding recommendation? Many Continuing Healthcare funding applications are thrown out because care notes and records are not up to scratch. In retrospective cases there are sometimes no care records at all. The issue of care notes in NHS Continuing Healthcare assessments is one of the most frustrating obstacles families face. 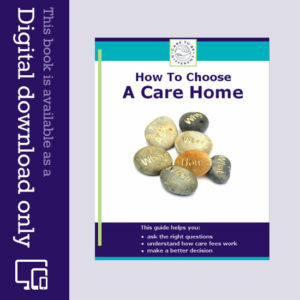 There are care homes and care providers who keep good, comprehensive notes on a day-to-day basis. Sadly, though, there are many instances elsewhere where the notes and records are simply not fit for purpose. A family attends an NHS Continuing Healthcare assessment meeting and the assessors look at the care notes to find evidence of care needs. If the care notes are not comprehensive, or they’re sketchy and fail to paint a full picture of a person’s day-to-day care needs, the assessor will generally say that a funding recommendation can only be made based on what’s in the care notes and if there’s no evidence written down of a specific need, then it doesn’t count. Even if there is a care worker – or even the care manager – in the assessment meeting, they may not want to acknowledge that the care notes are not up to scratch, and so that can be a big problem, too. Every decision about Continuing Healthcare funding comes down to one thing: the local authority legal limit for care. If a local authority takes responsibility for care (i.e. it means tests a person) when in fact the person’s needs are beyond its remit, it will be acting illegally. If a person’s care needs are beyond the local authority’s legal remit, the NHS must cover the cost of care through NHS Continuing Healthcare funding. On the other hand, if a person’s care needs are within the local authority’s legal remit, the person can be means tested and the NHS does not have to pay Continuing Healthcare. And so, assessors cannot make a decision about funding based on there being no adequate care records; the decision can only be made by looking at actual care needs. If there are no notes, the local authority cannot accept responsibility for care without risking stepping outside the law. 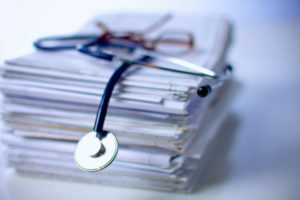 Throwing a Continuing Healthcare application out because of a lack of care records is not the same as throwing a case out because the person’s needs were within the local authority’s remit. If care records have been destroyed or are inadequate, a CCG has no basis on which to decide that a person was ineligible. Saying there’s ‘no evidence’ because of a lack of paperwork is a very different thing to there being ‘no evidence of a specific care need’. If the ‘system’ has failed to keep records, it is not the fault of the person who required the care. A decision about the provision of Continuing Healthcare funding must be accompanied by a valid, reasoned and written rationale from the Clinical Commissioning Group (CCG). A lack of care notes is not a valid rationale. Let’s look at the Decision Support Tool (DST) – this is the form used to record care needs during a full multidisciplinary team (MDT) assessment. If the care notes are inadequate, the members of the MDT cannot possibly have an up-to-date knowledge of these things – and cannot possibly carry out a reliable assessment of needs in each domain. You could therefore argue that the assessment is flawed. In a busy day and on a busy shift there is often little time to complete comprehensive daily care notes. In an ideal world it wouldn’t be like this but, sadly, the care system we have at the moment seems often far from ideal. Carers are also often massively undervalued and overworked. However, there is a wider serious issue here – and not just in relation to Continuing Healthcare. It is a potential safeguarding issue. Care staff need to refer to care notes to help them provide the right care to each individual. If the care notes are inadequate this immediately raises concerns about the safety and wellbeing of the person receiving care. A new member of staff looking at the notes should immediately be able to see exactly what’s needed and why. Where care notes are clearly inadequate, the care authorities should be raising concerns about such a failing as a matter of urgency, as it puts vulnerable people at risk. From the point of view of Continuing Healthcare funding, though, it’s vital for families to frequently check the check the care notes and to raise any issues, e.g. omissions, misleading statements, errors, or where there are just a few words like ‘routine care’ repeated across several different days with no substance or accuracy about what actual care is needed. In addition, care staff may have never heard of Continuing Healthcare, they and may not have any idea what kind of notes are required to support such an assessment. If you can, show the care staff the 12 domains and the eligibility criteria and explain that the care notes will be used to support care needs throughout the whole assessment process. If you’re asking a care worker or care manager to support you in an assessment meeting, make sure they understand the Continuing Healthcare eligibility criteria and the 12 domains. It’s worth stressing to them also that a Continuing Healthcare assessment is not an assessment of their competence as a care provider; it is instead an assessment of needs. Care notes and NHS Continuing Healthcare: training for care providers and care homes? We have come across a case where a Continuing Healthcare assessor in a full assessment meeting (MDT meeting) proudly announced that the Continuing Healthcare team trained all care homes in the area to keep the correct notes for Continuing Healthcare assessments. Whether this is actually the case or not is another matter. It was ironic in this instance, though, because the notes in the case she was assessing were inadequate. Ask the assessors what they have done to train care staff in your area to keep the correct notes specifically for Continuing Healthcare assessments. My husband is in the process of being Fast Tracked. Our consultant signed the appropriate form just before Christmas but I was told that we also needed another form showing what his health needs actually were. There is no mention of this second form in the guidance notes for the Fast Track process. Does anyone know why not? Our original assessment for CHC was invalid (and downgraded!) as there was no social worker present and in the second assessment his scores were 2x severe, 3xhigh etc. This should have meant automatic funding but, of course, these scores were downgraded by ‘the manager’. However, we are now in the Fast Track process so should acquire funding once this second form is filled in. I have found it quite worrying that none of these so called professionals seem to understand CHC or Fast Track. Even our GP had not heard of the Fast Track process. If we all persevere maybe things will change and I for one will be making sure the ‘manager’ concerned is held to account in due course. We carers must not allow these people to push us around. They should follow proper procedures and not be allowed to ‘play God’. Care To Be Different’s amazing website has been invaluable to me and can I also recommend everyone writes to the National Audit Office as Angela has suggested. Obviously, the NAO cannot deal with individual cases but if they get enough complaints about these ‘managers’ maybe something will be done. (I had an immediate reply from the Director). They are reporting in February so do write soonest. Dear Angela and all readers of Care To Be Different. Perserve with your applications for funding. Ours has just been approved!! This would never have been possible without Angela’s website. I am immensely grateful to her and do hope everyone else is as fortunate as we have been. Thank you for your very kind words, Flavia. Yes! You write clearly, and have obviously kept notes and recollections as a family which will challenge the “evidence” in his notes. Press for an assessment using all the information you have, and all that is available on this site and in Angela’s book. It’s hard, depressing work, but do it for your relative. Good Luck. We are now appealing our retrospectiveclaim for continuing care. We have virtually no records from the care home and only very vague medical records. We are toying with the idea of employing a Solicitor to help with our appeal but are finding it difficult to find one. I have read a lot of comments about the inadequacy of care notes from care homes and how this lack of adequate notes can often prevent people from being fairly assessed. I would be interested in peoples views on the following issue regarding not care home notes but NHS medical notes. I requested copies of my father’s medical records from the last five years from the mental health trust that has treated him for decades. . They include notes written by social workers, a manager who has never met him, CPNs, psychiatric nurses in a mental hospital as well as doctors. What is clear to me is that so-called health professionals do not always write notes that accurately reflect real events/patient’s health. Many of the instances described in writing by these professionals were carefully written in a language that resembled the nonsense ‘management speak’ so many of us experience in other contexts ie in commercial and office environments and the notes are clearly written not to aid in any way with a patients healthcare/medical condition. Instead they resemble diary entries written to cover the back of the writer and justify decisions. Some of the notes are completely inaccurate. For example a mental health assessment unit described my father as self managing with his urostomy. There was no record of the hospital contacting my sister at 11.30pm at night a few hours after he was transferred there from another hospital apologetically requesting drainage bags and equipment because they didn’t have any and admitting none of the nursing staff had any idea what to do so could she do it. Nor did the notes mention my sister attending daily to help my father with his urostomy. Instead the notes describe him as independent and coping well. There are frequent references in the notes of the social worker and CPNs and even a doctor to my father being a self funder – and yet we have never had a financial assessment having always declined them and so far all attempts to get an assessment for CHC have failed. So how can they call him a self funder? All the doctors and nurses dealing with my father -a very seriously ill man – assume all care outside a hospital environment/at home is social care. There are also references to the family being offered respite care and declining it. This is untrue. We said we believed my father would be distressed and unhappy and his needs would not be met with permanent admission to a private care home. And far from declining respite we told them that we had tried to arrange it privately and no home had been prepared to take him. There are also frighteningly inaccurate (false? )accounts of conversations with myself and other family members which are clearly designed to make the writer sound more professional and to justify lack of action. I have no faith in what is so often described as the much-loved and admired NHS. It is no longer a “national” service and it is no longer a” health” service. And for me the hardest thing has been dealing with its staff, the much-praised doctors and nurses. Compassion and care is at best in very short supply and at worst non existent. To NHS staff my father is an inconvenience like all elderly people who have the audacity to get ill and need to be looked after and we, as a family who care, are interfering nuisances who make their jobs difficult by actually expecting them to act like doctors and nurses. Most people go along with the narrative in the national press that politicians are to blame for all NHS problems but I see NHS staff (paid salaries by us the tax payers) actively colluding to deprive people of healthcare they are legally entitled to and I confess that this, on top of the stress we have all been under and the deep unhappiness we have felt as we have watched my father’s health decline, has been the most dispiriting thing of all. Is there really any point in continuing to fight to get my father assessed for Continuing Healthcare (CHC) when everyone involved will be doing everything they can to stop him getting it? Meggie – Your observations about the ‘management speak’ style of many notes are interesting, and I know many families would agree with you on that. Also, many health professionals do not seem to understand what their notes might be used for, and sadly many notes do nothing to support a funding case, even when the person requiring funding is clearly eligible. It’s a similar problem with the seeming lack of understanding by many health and social care professionals of the difference between social care and healthcare. Anyone not receiving NHS or local authority funding will be described as a ‘self funder’, regardless of whether or not they’ve had a financial assessment. Regarding your last question, I can completely understand how difficult this is – as can thousands of other families. Every week, though, we do hear from people who have secured CHC funding, even if it’s after a long battle. Sometimes a breakthrough can come when the CCG finally realises you’re not going to give up. It shouldn’t be that way, of course, but it often seems to be. Does anyone know whether, and if so how often, nursing and care homes are required by law or regulation, or failing that recommended (by practice guidance) to take the heart rate, blood pressure and weight of their residents, particularly residents who have a history of heart attacks, strokes and high blood pressure and yo-yoing weight? Andrew – I don’t know the answer to this, but I would hope that care home residents with these conditions would have these readings taken daily. You’ll need to research that though. Sarah – many families ask the same questions you have. It is indeed difficult to see how a person could really be properly assessed if the people assessing them never knew them. Care notes and care plans are vital in all this, and yet sometimes these are no longer available. There is a backlog and it’s hugely frustrating for families waiting for their cases to be dealt with. Keep the pressure up on the Continuing Healthcare team. Contact them frequently and regularly. Let them know you’re not going to go away. I would welcome any thoughts on the following. To what extent should a multidisciplinary team (MDT) assessing an individual for eligibility for NHS Continuing Healthcare be aware of, and consider, earlier Decision Support Tools completed previously for that individual? Andrew – normally the previous Decision Support Tools are referred to, as they can be a useful indicator of how care needs have increased (or otherwise). For example, if a previous Decision Support Tool indicated that a person should be receiving Continuing Healthcare funding, and at the next review or assessment their needs have clearly increased, it would be hard for the MDT to justify a recommendation of anything other than continued CHC funding. A DST was completed whilst our loved one was in hospital. The MDT at that time decided our LO’s cognition was severe. Many months later a subsequent MDT (completed when our LO had been moved into residential care) decided our LO’s cognition as no more than high. As far as I am aware, so far there is no effective medical treatment to improve cognitive decline. It looks like the subsequent MDT didn’t bother to read our LO’s subsequent medical records at all, nor read and understand our LO’s residential care records. The DST completed whilst our LO was in hospital had the benefit of evidence that was very detailed and focused in capturing our LO’s needs and decline recorded by the hospital nursing staff, as well as assessments undertaken by specialists whose expertise is recognising cognitive impairment. Is it always necessary for someone’s needs to “increase” for them to keep NHSCHC? That’s a good point, Andrew – there’s no need for care needs to increase for CHC to continue. As long as the care needs still represent a Primary Health Need, CHC should continue to be provided. Care needs could even reduce, but if the overall picture if need is still an NHS responsibility then CHC should continue in that instance too. Hi All, Its so upsetting to hear of many case, we too are going through the assessment after dad has had CHC funding for 2 years. The leader assessor on Monday said nothing had changed and Dad behaviour from meeting with us and the nurse from the unit has got worse, then we find we have been ‘deferred’ as Dads notes including ABC forms etc have not been completed and therefore there is no evidence. We have demanded the home gets statements from each carer to dads behaviour as we cannot turn back the clock to do these notes. Our care home is in critical at the moment with no lead for over 12 months and this doesn’t help. I just don’t understand if Dad has changed and behaviour is worse how they could consider turning him down, its a lawsuit waiting to happen. We have formally complained to the care home, its commercial group, the CQC and the CCG, lets see how this develops! Its my first post as I believe everything the authorities have done has been acceptable for my 76yrs old mum to-date. She has severe rheumatoid arthritis, and osteoporosis. Her health has rapidly deteriorated since May this year and now she has lost all mobility in her arms and legs and has no core support. She has spinal compression at the base of her brain stem so is very vulnerable to serious complications or death if she falls heavily on her head or is manually transferred with any deal of force. We have just been informed that surgery is not an option due to life threatening risks. Her condition will now gradual get worse. She has also been diagnosed with the onset of dementia which has been controlled by medication for now. Social services have now taken charge of her care needs and she is being looked after by carers at home four times a day. She has had a financial assessment done and has to pay about a quarter of the costs due to having capital just below the top threshold. This week the OT has decided to remove her standing aid called a cricket as she cannot lift herself any more. They are using a mobile hoist which has now had an increase in carers hours. The local authority have refused to increase this charge as she has had two increase approved at panel. She currently gets approx £580 per week and I run her direct payment account. The new figure is estimated at being in the area of about £850 per week. The local authority say they we will have to find the difference, and they are now looking at a more cost efficient was of supporting mums care needs. Social worker has advised today that she is now giving mums care needs a full review. I cannot fault the help she has been getting at home by the social services and OT.. We are waiting for a ceiling hoist to be fitted and a wet room to be approved, and she has just had an assessment for technology to be installed to help her control the phone, TV curtains lights etc.Hopefully this will reduce the carers time and the bill. We have just has the second CHC assessment and all present intimate mum has a very strong case especially as her condition is deteriorating so fingers crossed. 1.My concern is that mum will have to use her savings to top up her care bill if the local authority has now capped it. Can she be made to use her savings to finance her care needs. She has a comfortable income which at the moment covers her existing part she has to pay. 2. She may end up in a home as this may be the cheaper option ( all say she is still suitable to be cared for in her bungalow). 3. Can she be forced out of her own home purely for financial reasons. She is not at risk to herself as she cannot move out of her chair or bed. She is totally reliant on her carers to feed, wash her etc. 4. What may happen if we cannot raise the additional funds to cover her care charges. I am anticipating a battle as other cases I have read on this forum seem to be worse than ours. My mothers Care home sent checklist off in Oct 15, I heard nothing. Then Checklist people said they needed clarification to trigger a full Assessment. The Care Home provided this in Jan 16. The full Assessment for NHS Continuing Healthcare (CHC) was held 31/5/16. Today 4/10/16 – 19 weeks later and almost a year since Checklist was sent – I have still not been notified of any decision despite regular phone calls and an e-mail. Each time I have been told the case is in the “Eligibility drawer” awaiting the Panels decision. Today I rang and was promised a call-back from the Nurse who was one of the Assessors- I am waiting… They said in June they needed more info re my mum’s Dementia as the Care Home missed logging several weeks of fierce aggression. This would push her Behaviour from High to Severe – thus giving her 2 Severe ratings and full ChC funding? When I mentioned this at the Assessment the Assessors said even if she was awarded 2 Severe ratings it does not necessarily follow that she would get full funding. Also I believe she was rated lower as Assessors said `scores cannot cross Domains` – I dont think this is true. Can I complain based on flawed process – that full Assessment should be carried out within 29 days or can it be delayed while more info is sought? My mum sadly died in July 16 – but I am battling on. And who should I complain to? Many thanks. Jennie – that’s an appalling delay. Contact NHS England and insist on an independent review (IRP). Copy the CHC people into this so they’re aware of what you’re doing. NHS England will almost certainly say you can’t have an IRP at this stage, because the process isn’t complete, but it may jolt the CCG into action. Also, be sure to pull together an account of everything you disagree with in how the assessment process has been conducted so far and the way the eligibility criteria have been applied. It sounds as though you have grounds for appeal on both fronts. The process is supposed to be completed in 28 days. In my experience, and in the experience of many families who contact us, this rarely happens. After 4 years toing and froing at first via a claims company and then for the last 6 months on my own. I am finally having my grandfathers retrospective claim investigated by the Ombuidsman. Unluckily for me, the Care home’s notes are sparse. Luckily for me i have historic evidence of conditions my grandad suffered with that the carehome AND the carehome GP were ignorant of. E.g My Gandad was diagnosed with pneumoconiosis in 1960 yet on the breathing section of his notes, there are 13 noted records, only 1 refers to grandads breathing being ok, 12 comment on breathlessness and they still think it only warrants a C on his score. One instance in his notes the doctor is called because of his breathlessness and wheezing yet the doctors remarks ” Maybe he’s getting a cold”. Proof of their ignorance yet the CCG still wouldnt take this evidence. In the course of my investigations i have discovered more problems regarding the NHS need to transfer care to the local authority. So i am now taking action against Carehome, Carehome GP and the hospital on things ranging from Drug Misadventure to incompetance. All this as come to light because i looked further into his care and not just his funding. That sounds like a good strategy to look further into his care, Paul. No one saw my mother either . She passed away last August . I am at IRP stage and am quite prepared to take it to the ombudsman. My Aunt was never actually seen during a Continuing Healthcare (CHC) assessment. She remained in her room and only the Checklist and care home notes were used. Needless to say it was decided that she was ineligible for CHC costs. Is this the correct process? My Aunt has since died and the Ombudsman is currently investigating the case. Jennifer – It’s actually unusual for the person needing care to be in the assessment (bizarrely), and of course in many cases the person needing care may not understand what was happening and may find it distressing. Assessors usually spend a few minutes with the person beforehand – and (from accounts we receive from many families) often seem to ask just a few irrelevant questions and yet use that to form an (often false) impression of the person’s needs. The assessment should have been carried out by people who had a good and up-to-date knowledge of your aunt’s care needs. Wishing you well with the Ombudsman. The Ombudsman have not upheld my complaint. I have supplied additional comments but the decision has remained unchanged. Have you any experience of the next step and what that might be? My father had an assessment and failed the assessment and now is ready to be discharged home., He requires 24 hour care but was only awarded the NHS Care element for care home. What is the bet action I can take on this matter. I feel their is very limited support with care professionals and Social workers. I thought if you scored 2severes it was automatic you are eligible for CHC . Precisely Jean. However , the weightings were lowered at a ‘closed door meeting ‘ one week after the MDT meeting. The CCG said there was not enough evidence to support the weightings and I have been fighting Mum’s case ever since. They did not try to seek any further evidence, just took it upon themselves to lower the scores on the DST. This was in January of 2015 and I am still battling against them. Have been to two panel meetings and am now waiting for Independent Review Panel (IRP). Remains to be seen how that goes. We had an independent assessment of Mum’s needs carried out and the assessor clearly identified a Primary Health Need. These people seem to be a law unto themselves but I am not going to give up. Three years ago when we last made an appeal on behalf of our mother we were told what was needed (severe, high etc) to qualify for funding. This time around we’ve been told that clarity no longer applies and that it’s a much less cut and dried approach, with more emphasis on proving intensity, complexity …. That would appear to be a very convenient way of denying funding when 2 severes or I priority has been identified. I don’t think anything has changed within the National Framework to override the 2 severe / 1 priority automatic funding trigger unless anyone knows differently . I thought that the intensity ,complexity ….etc came into play to help decide borderline cases but I may be wrong on that . Thank goodness for this website it is so helpful. Thanks for your kind words, Shirley. I am awaiting IRP meeting in October and have requested a copy of the original handwritten DST completed by the nurse assessor at the MDT meeting which I watched her complete. I have now been advised by that nurse assessor that it was only a rough copy and has been shredded !!!! Could it have been because Mum scored 2 severes on that DST . Unbelievable !!! Any comments please?? We also had a situation where the local resolution meeting had to ask for the doctors and nursing home records again as the original multidisciplinary team notes had been shredded before being put on the computer system!! Shirley – we have heard from other families of vital documents being altered and/or destroyed. Complain strongly! if there’s no DST document, make sure the IRP chair knows this in advance. He/she may requires the CCG to repeat the process. I only signed up for the free bulletins yesterday and today received the first one in my inbox. And what a surprise to see that it was exactly about the type of case i’m fighting. Mine is an appeal against the decision given to a retrospective claim for CHC relating to my mother who passed away two years ago. The original claim was made after my mother passed away in the care home, and it was a short time after that my sister and I first became aware of CHC, despite my mother being resident in the care home for six years and paying towards her own funding. On finding out more concerning CHC, following the “ineligible” decision, I could not believe the DST could be used accurately with such a small amount of evidence ans so, decided to appeal on that basis. Three and a half years in from the original claim, and still waiting! This perfectly fits my my case at the moment. Ignorance of health needs by not just Care Home but Care Home Doctor. One of my Grandads illnesses was depression, 6 months before Care Home admitance, he had been prescribed antidepressants but because he had been admitted to hospital within 2 weeks of his first prescription, a lack of communication meant they were never re-ordered. i.e, the hopsital failed or his GP failed to follow up on this drug prescription. Care Home have a total of 17 days were they describe him as “In Pleasant Mood” so, CCG say not depressed. I have further examples of ignorance of my grandads problems but wont bore you. Needless to say, my case is now pending with The Ombudsman. I have been fighting my mother’s case for CHC funding for almost 4 years and we are now finally at IRP stage on 5 th October. I have encountered the same problem of care home notes ” not being of a good enough quality” The notes were in fact extremely comprehensive and informative . Also , just as a matter of interest , we have also had oral evidence given by mum ‘s carer, who was invited to the MDT meeting , dismissed in the recommendation as being “anecdotal evidence” . !!!! Why on earth spend 3 hours at the MDT discussing Mum’s needs with myself and her carer when the evidence is then promptly dismissed ???? An issue which I shall certainly be bringing up for discussion at the IRP . This is exactly the difficulties we are facing as we appeal the decision that our mother is no longer eligible for funding. One of our arguments within the appeal is that if it was considered notes were inadequate (as was stated by the assessor to the head of care on a few occasions) then the assessment should be rearranged until more detailed notes could be provided. Following a local resolution meeting it was recognised that Doctors notes hadn’t been used either, so our mothers case has been put forward to a review panel. The care home where our mother lives is in fact very good and we have no concerns about the notes they write. But we have found that the amount of detailed notes CHC require is over and above what a home would normally keep. We also have concerns that staff, heads of care, and managers know less about the process than we do and don’t appreciate WHY some level of notes are required. All very frustrating. This is excactly what I have been up against in my Dads assement ,the care home Dad is in is really good and I am happy with the care he receives ,but at the meeting the lead assessor was saying there wasn’t enough evidence in the notes ,also why did the carer or careers not record in the accident book the times when Dad hit or hurt them ,he went on to say if anything came of one of injuries that was caused by Dad the home would not be insured .i did reply by saying if the care staff had to write every thing down they would have no time to care for the residents ,the care home nurse who was in the meeting said when incidents happen the care staff just take in their stride ,they get used to it ,. The assement was done on the 15th August ,with their recommendation that Dad was not eligible ,it is now the 21st September and I still havnt had any letters from the CCG informing me of the outcome . I think you’ve touched on an important point, Jean – which is that care staff get used to the care they provide and the challenges they face each day, and so don’t necessarily see any reason to write it down. It so frustrating for families. Just because care is ‘routine’ for care staff doesn’t mean the care needs count for less in an assessment. Not sure whether this question is in the right thread. Does anyone know what legislation covered the safeguarding of vulnerable adults prior to The Care Act 2014? Does anyone know what standard the Local Authority, or others had to attain, to discharge this duty, and what evidence might support this. Finally, did the duty extend to self funders? We have just returned from our first CCG meeting at our mother in law’s care home, which the CCG representative cancelled as she said the care home notes were not adequate so the meeting would have to be rearranged as there was no evidence. 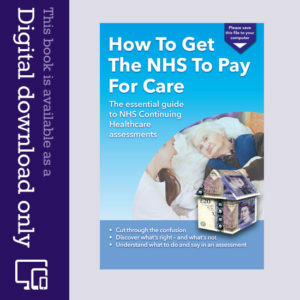 We had downloaded your guide which is excellent and spent several weeks researching our case for NHS funding for my mother in law who has Alzheimer’s and is at stage six, we have looked after in her own home for five and a half years and who we had to put into full time care five weeks ago. Her condition had deteriorated greatly over the last six months and we were just at the end of our tether. Her mental health nurse had rearranged her diary to be there to support us and a social worker also attended. Our concern is that the CCG nurse just stated that we need written evidence and that because the care home is not a nursing home her needs are not health needs. My concern is that in the five and a half years when we looked after her we have no written evidence as such, just notes that I made for each of her six month memory clinic checks. Does this mean we will be turned down?My understanding was the DST was the basis of the process and that the decision should be based on the individuals care needs. What other kind of evidence can we provide. Any help would be much appreciated.